I’ve been getting a little frustrated with the attention that I’ve been getting because of the hair. I love the hair, and I think that the color works well for me, but I get much more attention than I thought I would and I couldn’t understand why. Lots of people have different colors in their hair, why should it be such a big deal? It all connected for me today though, when I saw a guy whose hair was so obviously dyed black it was almost painful and he was giving me the same stare that most people do. It’s the style! 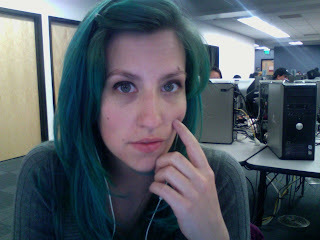 My hair is green, but I still dress and style my hair as though I’m on my way to be a soccer mom in the next 7 years. The incongruity is what’s throwing people off! People don’t know what to think of me. Am I a little punk with green/blue hair, or am I a “typical” middle class white girl who conforms to society’s expectations? Hopefully this new understanding will allow me to not mind the looks so much. I think I’ll have to wait until Thursday to really know since it’s so late now and tomorrow is a holiday and I won’t be going out in public much, especially with the painting of a house taking place and all. "People don't know what to think of me. Am I a little punk with green/blue hair, or am I a "typical" middle class white girl who conforms to society's expectations?" Then you're conforming to neither expectation! If you like it don't worry about it. I think you look lovely… kind of like a mermaid.